As I type this post, there is a foot of newly fallen snow on the ground, we are experiencing Winter in Spring here in Wisconsin! Bring on the true Spring! 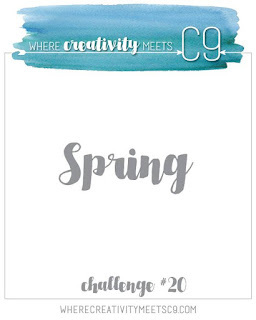 The April Where Creativity Meets C9 Challenge #20 is posted and we would like for you to be inspired by Spring! There's so many awesome products from Concord & 9th that will work for this Challenge and we can't wait to see how you were inspired, as this challenge is dedicated to the innovative stamp company and their products! I started my card with a plain old white cardstock base, and let the stamps and ink do the work for me. 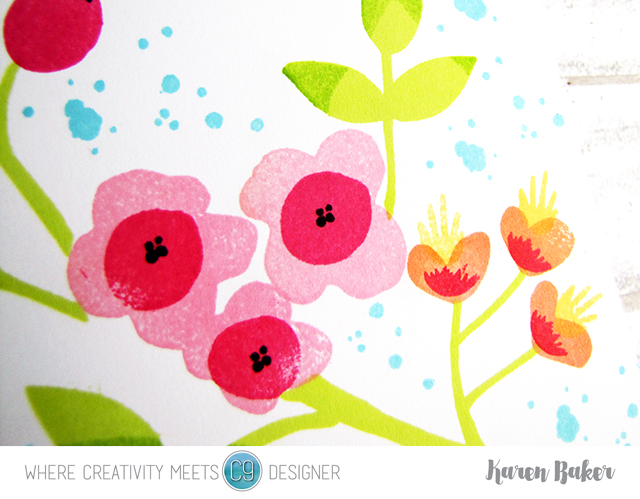 I used the Flourish, along with Catherine Pooler Inks, to create an springtime scene of a tree branch with berries and blossoms. I added a few splatters Hello Lovely, to represent the sky and finished the card with a sentiment from Many Mandalas. The challenge is sponsored by the fabulous Concord & 9th and one lucky random entry will receive a $25 gift certificate for a Concord & 9th shopping spree. The favorite entry will be asked to guest design for a future challenge! The challenge runs until April 29th, so there is plenty of time to pull out your favorite Concord & 9th stamps and die and create Plus, new Concord & 9th products were released TODAY and they are fantastic! 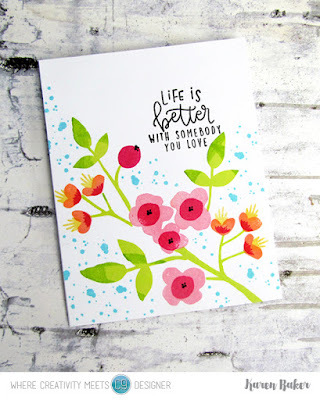 This is SO pretty - I love the softness of the stamped images - and the placement of the sentiment. As usual - inspiring work, Karen! I love your card. I love the image and color choices. Fun awesome card. Beautiful card, Karen!!! Love all of that stamping and those gorgeous ink colors!!! Oh how pretty Karen and full of spring!! Karen, this is so pretty...gorgeous colors! Those inks are so bright and bold! Fabulous card! Love the look of this Karen~so playful and free!